[prMac.com] Atlanta, Georgia - NetSpot team becomes Etwok, LLC and releases NetSpot on the Mac App Store. This step is very important for the company. NetSpot gained immediate visibility like never before, and proves to be a great user-oriented professional app. It's #4 free app in the Utilities category and #20 overall among top free Mac applications. NetSpot immediately grabs an outstanding rating of 5 stars. Unlike other WiFi site survey apps which may cost you thousands of US dollars, and which are only available for Windows OS, and might even require additional specialized hardware to produce any results, NetSpot is free and will run on any modern MacBook. NetSpot requires Mac OS 10.6 or 10.7 and is known to run fast and flawless on developer releases of OS X Mountain Lion as well. 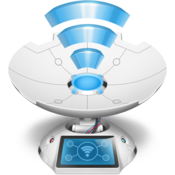 NetSpot is a professional wireless network management app designed exclusively and natively for Mac OS. It was not transferred or reworked from a Windows app, and was built from scratch to map your WiFi coverage using your built-in AirPort adapter. Every Mac user having a MacBook can run a WiFi site survey using NetSpot in minutes; no special knowledge is required. NetSpot lets anyone easily build a WiFi map: get on the Mac App Store, search for NetSpot, download it for free, then load a map of the area of interest into NetSpot (developer's knowledgebase has a number of hints on how to do that), click to mark your location on the map, wait while it scans WiFi signal around you, take several samples like that, stop scanning and choose one of the visualizations. Very quickly you'll be able to get a Signal Strength report, visualize Signal-to-Noise or Signal-to-Interference ratios. There are total of 5 reports available. All of them are explained in details in the project's knowledgebase at help.netspotapp.com and can be exported into PDF for further analysis or presentation. "After several months in development and a somewhat tedious review process, we are thrilled to announce that NetSpot, our award-winning free WiFi survey and analysis app, is finally available on the Mac App Store." - says Al Kogan, the NetSpot project designer. - "Once the upgrade to version 1.3 went public, we are getting about 3000 new users every day and are extremely excited to see the newcomers and get tremendous feedback from them. We are very open to your comments." The first ratings that appear on the Mac App Store should also add some enthusiasm to the NetSpot team. The latest NetSpot homepage update brought the long-awaited knowledgebase to life explaining many details behind the WiFi science. Public discussion board is active. NetSpot is compatible with any Intel-based MacBook running Mac OS X 10.6 or newer and is 64-bit ready. Mac OS X Lion (10.7) and OS X Mountain Lion (10.8, preview releases) are officially supported. NetSpot 1.3 is just 4MB in file size. NetSpot 1.3.344 is Free and available worldwide through the Mac App Store in the Utilities category. Please send your technical questions and comments to onair@netspotapp.com, or contact Al directly with any project-related inquiries. Etwok LLC is a software development company, specializing in system software utilities for Mac OS X. Etwok was established in 2001 and delivers high-end software solutions. Copyright (C) 2001-2012 Etwok LLC. All Rights Reserved. Apple, the Apple logo and Macintosh are registered trademarks of Apple Inc. in the U.S. and/or other countries.